High on some of the most pristine and remote mountains in northern Thailand live the Akha, a little-known, self-sufficient and culturally unique people who prefer to avoid city life in favour of a distinctly rural idyll. Who are the Akha People? The Akha are a relatively poor tribal people living on the very top of the most inaccessible peaks. Of Tibetan origin, they are the most recent hill people to have migrated to Thailand, and they are perhaps the least conversant with Thai as a language. They are immediately distinguishable by the elaborate and beautiful headgear of the women – perhaps the most remarkable single feature of Thai hill tribes. Today there are more than 55,000 Akha living in Thailand, practising shifting cultivation of various crops including maize, dry rice and temperate vegetables. Until quite recently the Akha were often involved in opium cultivation, though today this has been replaced by lamyai fruit, coffee and tea as the crops of choice. Akha women are most easily distinguished by their elaborate, helmet-like head-dress, made up of silver coins, beads, feathers and fur. Clothing – characteristically a long-sleeved jacket over short skirt ending just above the knees – is of indigo-dyed cloth, often made with home-grown cotton, decorated with embroidery, buttons, cowrie shells and seeds. Akha women also wear elaborately embroidered puttees between the knee and ankle. Pendant earrings and broad neck bands of silver are highly prized, the latter worn with multiple strings of brightly coloured beads. By nature Akha tend to be polite, retiring and often a little shy. Few outsiders visit them in their mountain fastnesses, and when Akha visit local towns on business, they generally hurry back to their hills just as soon as time allows. But in rustic Chiang Rai it is now possible for tourists to visit an Akha village, enjoy an authentic Akha homestay, learn first-hand about Akha culture and traditions, and experience the Akha's unique relationship with nature and the environment. The small, community-based Akha village of Huai Kee Lek nestles on top of a forested peak high above the rushing Huai Masang river some 30km north of Mae Suai in Thailand's northernmost province of Chiang Rai. The valley below is defined by verdant rice terraces and mixed Thai and Lahu villages, but Huai Kee Lek is richly and distinctively Akha in nature and appearance. The village was established more than forty years ago in 1965, in an auspicious spot selected by the community elders. Once chosen, an Akha shaman threw chicken eggs to determine the village precincts and identify necessary sacred sites including the village gate, sacred well and cultural grounds. According to the villagers, these activities attracted a number of local and foreign visitors to visit the new village, and in time this led to the idea of setting up homestay facilities to attract tourists and increase the community income. The concept has worked well, and today Huai Kee Lek tourism is managed by a village committee while profits are used to sponsor both Akha cultural activities and local forest conservation projects. Akha first began arriving in Thailand in the late 19th century, migrating mainly from China's Yunnan Province by way of Burma. They speak Akha, which is a Tibeto-Burman language, and are closely related to both the Lisu and Lahu peoples. Traditionally, Akha place a great deal of importance on genealogy. Children learn their family history at an early age, and emphasis is placed on honouring parents, elders and ancestors. As part of this custom, they have an extensive oral history of their ancestors going back at least 15 generations, and this is preserved in a series of chants. As animists, the Akha believe in a world brimming with locality spirits, some benevolent, some indifferent, and some downright dangerous. These spirits have a very direct and definite impact on the physical world, and must be appeased or kept at bay. Should the natural balance of existence in and around an Akha settlement be disrupted, the direct results can be hardship, ill-health and even death. The practice of traditional Akha religion includes placing ornately carved spirit gates at the entrance to a village where guardian tutelary spirits are believed to dwell. Ban Huai Kee Lek is a rather forward-looking ‘traditional Akha village'. 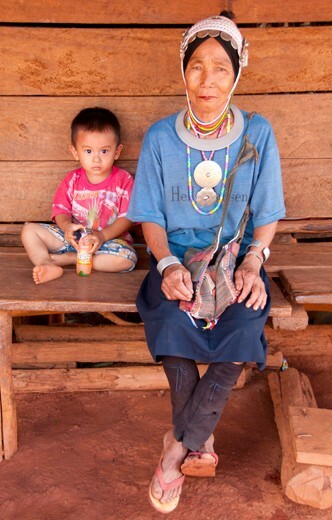 Some of the villagers observe the old Akha religious customs, while others are Buddhist, and still others Christian. But the village as a whole recognizes the importance of preserving Akha cultural traditions, and great care is taken to mark off and protect spiritual sites of importance, including the spirit gate and surrounding copse, the cultural grounds used for the annual swing festival, the sacred well and the dwelling places of local tutelary spirits. The concept of community-based tourism has also certainly helped to foster and protect traditional Akha music and cultural performances. The villagers at Huai Kee Lek are encouraged to be proud of and preserve their cultural identity, while at the same time profiting materially from the additional funds such activities bring into the community coffers. In addition, while Akha women are still devoted to their elaborate traditional costumes and heavy, jeweled head-dresses, community-based tourism has helped to reinforce this tradition. Akha also observe at least nine formal cultural festivals year-round, the most important of which are Chon Khai Daeng in April, the Lo Ching Cha Swing Festival in August, and the Top-Spinning Festival in December. Visitors to Huai Kee Lek at these times are especially welcome. Besides staying in a genuine Akha stilt house with really amiable and helpful Akha families, visitors have unusual and unparalleled opportunities to observe the Akha at work in their fields which are situated some distance away from the village, chiefly to protect them from domesticated animals – notably the docile but ravenous sway-bellied black pigs that lay sleeping beneath the houses when not prowling for food. Akha work hard at growing their own maize and dry rice as staples, while increasingly farming tea or coffee for cooperatives in Wawee, the nearby district centre. Tourists can also explore the surrounding forests in the company of an experienced Akha guide who will explain the practice of sustainable forestry, hunting and gathering, and the essential arts of self-preservation and spirit-appeasement! Akha have for long centuries enjoyed a special relationship with the surrounding forests, traditionally practicing ‘shifting agriculture' by cutting and burning the undergrowth, farming the ash-fertilised slopes, and moving on after two or three years to leave the depleted fields fallow to recover. Unfortunately, due to population pressure, this is no longer sustainable, and great care has to be taken to husband and preserve what remains of northern Thailand's once pristine forests. Huai Kee Lek village is well off the beaten track, and yet relatively easily accessed by a good surfaced road from the district centre of Mae Suai to the small valley settlement of Ban Masang; from here it's a steep but safe drive for 3.5km along a concrete and compacted earth road up into the hills. The first views of Ban Huai Kee Lek, glimpsed across a narrow, tree-lined valley, are spectacular indeed. There are currently 15 homestay houses in the village, and visitors will be greeted by the local Akha schoolteacher, Mr Vuthikrai Mawpaa, who is also in charge of no fewer than 65 shy but studious village schoolchildren. Local guides will show visitors around the village, pointing out important spiritual and cultural sights and explaining their significance to the Huai Kee Lek Akha community. Guests learn about traditional Akha beliefs, see Akha costumes and handicrafts being made, experience everyday Akha activities and sample Akha cuisine. In the jungle beyond the village they will be guided to see the plants and wildlife that still remain at the centre of Akha lifestyles.